If you&apos;re in Guangzhou for the Mid-Autumn Festival, the following guide to local festival customs and best places to celebrate should prove invaluable. 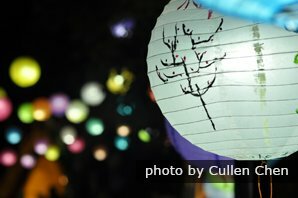 The main customs of the Mid-Autumn Festival in Guangzhou include hanging lanterns, eating river snails, worshiping the moon, and bathing in the moonlight. Lanterns of Guangzhou Mid-Autumn Festival. Each family makes lanterns with bamboo strips as the Mid-Autumn Festival approaches. The lanterns are made into various shapes, with representations of animals, fruit and insects. Candles are lit inside the lanterns at night and smaller lanterns are stringed to the main lantern. The strings of lanterns are then tied to a bamboo pole, which is fixed in front of the door or hung in trees. 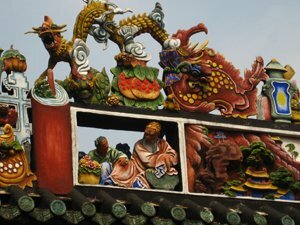 This practice is believed to bring good luck to the family. The height of the lanterns is said to determine the level of luck the family will enjoy: the higher the lanterns, the luckier the family will be. 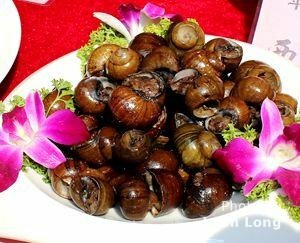 River snails are traditionally an indispensable food of a Mid-Autumn Festival dinner for people in Guangzhou. River snails are usually cooked with medicinal herbs to dispel the unpleasant smell of the snails. Eating river snails during the Mid-Autumn Festival is believed to help brighten the eyes. In the areas of Chaozhou and Shantou in Guangdong Province, women and children worship the moon on Mid-Autumn Festival nights. As night falls, they burn joss sticks in front of a table with offerings of fresh fruits on it. Good wishes are whispered to the moon when worshipping in hope that the moon would bring them good luck. In the old days, women in Dongguan believed that the moon was a matchmaker. Families with young men or women who had not found their beloved would burn incense under the moon and beg the moon to bring them their love. Tradition has it that women might become pregnant if they quietly bathed in the moonlight on the night of the Mid-Autumn Festival. In some areas, on the moonlit night of the Mid-Autumn Festival, some women, who were married for a long time but were infertile, went out of their houses and bathed in the moonlight all the while wishing to have lovely babies. People called this "moon bathing". Autumn in Guangzhou is the golden season, with warm sunny weather and clear skies to enjoy the moonlight in the evening. The festival is a family celebration and usually many outdoor activities in the city are arranged especially for the event. On the evening of the Mid-Autumn Festival, families stay up late and get together eating moon cakes and gazing at the moon. If you want to take part, invite a few friends and check out one of the following places to sit and watch the moonlight. The Pearl River is the third longest River in China, next to the Yangtze River and the Yellow River. The river cuts through Guangzhou and many famous attractions are clustered along the river. In the evening, both banks of the river are lit brightly and joined by the bright moon hanging in the sky. The pleasure boats, filled with passengers, cruise the Pearl River, from the west to the east, moving elegantly on the river, while playing happy melodies. Moon cakes and tea are served during the cruise. Rose Garden Bar is on Shamian Island, adjacent to White Swan Hotel. The bar offers a pleasant environment surrounded by green trees along the Pearl River. The historical buildings of French and British styles nearby give it an exotic feel. Shamian Island used to be a colony of France and Britain in the 1920s. The bar serves good Western style food. The night scenery along the Pearl River viewed from the bar is great. Location: 7 Datong Road, Ersha Island, Yuexiu District (广州市越秀区二沙岛大通路7号). Celebrating the Mid-Autumn Festival in an atmosphere accompanied by traditional Chinese melodies will make your festival very traditional. It was customary to listen to Chinese ancient music or play traditional Chinese instruments while watching the moon. Traditional Chinese instruments are played at the White Swan Hotel. In addition, the Tiantai offers a great view of the Pearl River night scenery. Yuntai Garden is at the entrance to White Cloud Mountain. It caters to people who prefer tranquility. There are over 200 varieties of flowers planted in the garden. It is wonderful to watch the moon while enjoying the floral fragrance. At the top (23rd) floor of Pearl River Hotel (珠江宾馆), the restaurant is round in shape, with decorations in the traditional French style. It looks upon the Pearl River and Ersha Island. It specializes in authentic French cuisine and French palace food. Cultural activities are usually held in these two parks for the festival. The most common celebrations in past years have been the lantern shows. The parks will stay open until midnight on Mid-Autumn night.